This post is sponsored by Litehouse. 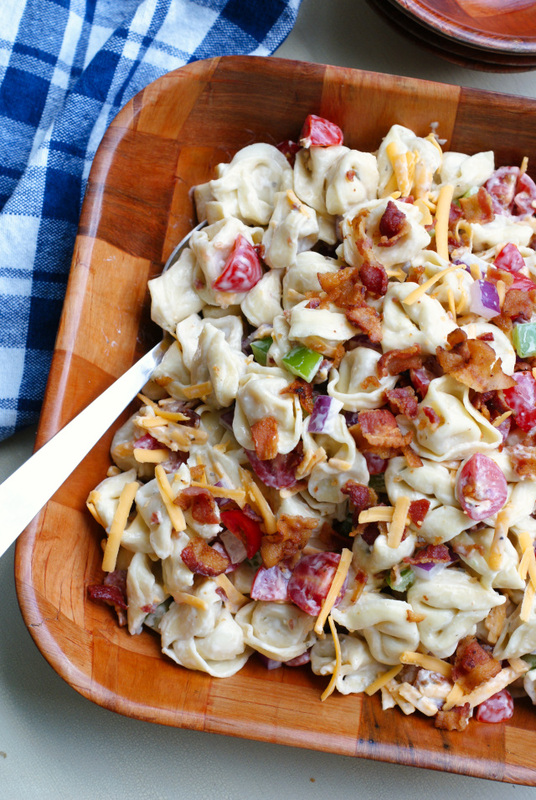 This Bacon Ranch Tortellini Salad is a party perfect pasta salad that pairs cheese-filled tortellini with fresh veggies, cheddar cheese, cool ranch dressing, and lots of crisp crumbled bacon. Here we are smack dab in the middle of summer. How did that happen already? Time is flying this year and I'm trying my best to take advantage of every opportunity to entertain and enjoy family and friends. Summertime is for cookouts and reunion-style family get-togethers, am I right?! There are few things I enjoy more that hosting a party and showing my love to friends and family by cooking lots of yummy food. I'm sure you've heard the old saying, The way to one's heart is through their stomach, right? I swear it's true! When we get everyone together and I'm serving to a fairly large crowd, I usually keep it pretty straight forward with my main dish to make sure our picky eaters are happy. Burgers, dogs, and grilled chicken are always popular and then I will supplement with creative appetizers and side dishes. 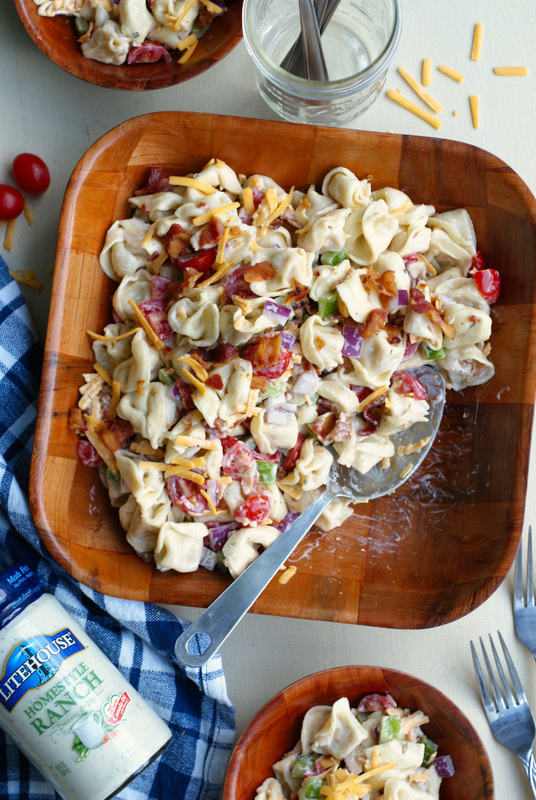 If there's one thing that goes well with all of my favorite summertime mains, it's pasta salad! Seriously, you can't go wrong! A pasta salad can be super customizable and easily scaled depending on how many you are serving, making it ideal party food. This pasta salad is super fresh and loaded with so many of my favorite pasta salad mix-ins. I used tortellini for my pasta base which is a great way to mix things up a bit on the pasta end. 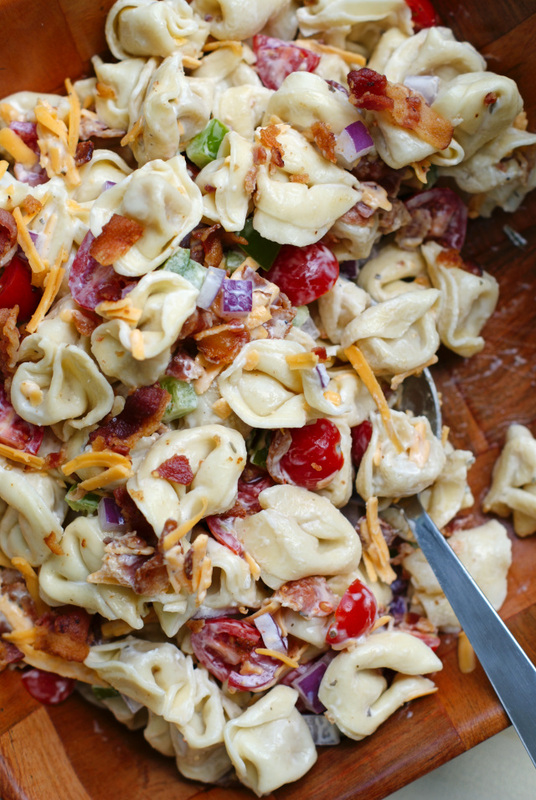 Plus, the tortellini holds up really well to all of the veggies, sharp cheddar, and bacon going on. 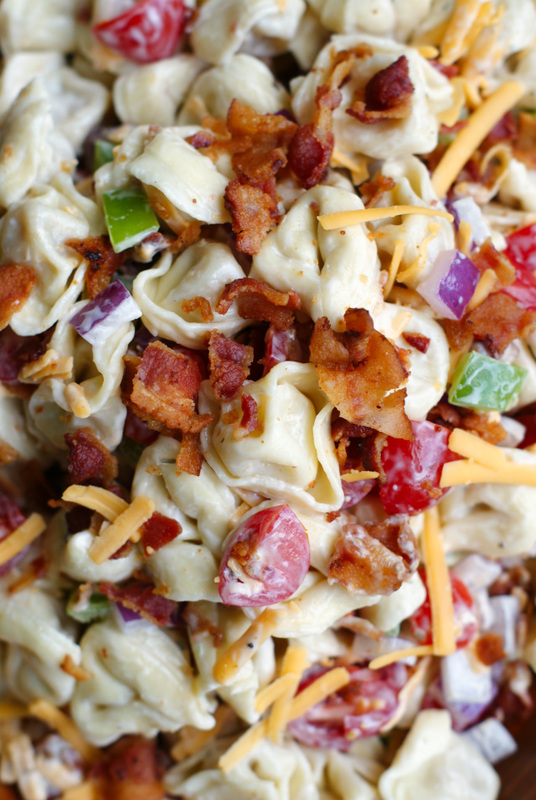 And boy, is there a lot of veggie, cheesy, bacon goodness in this salad! I'll tell you what really makes this gorgeous salad a winner....it's the dressing! I used Litehouse Homestyle Ranch Dressing and it was the perfect component to bring all of my salad goodies together. 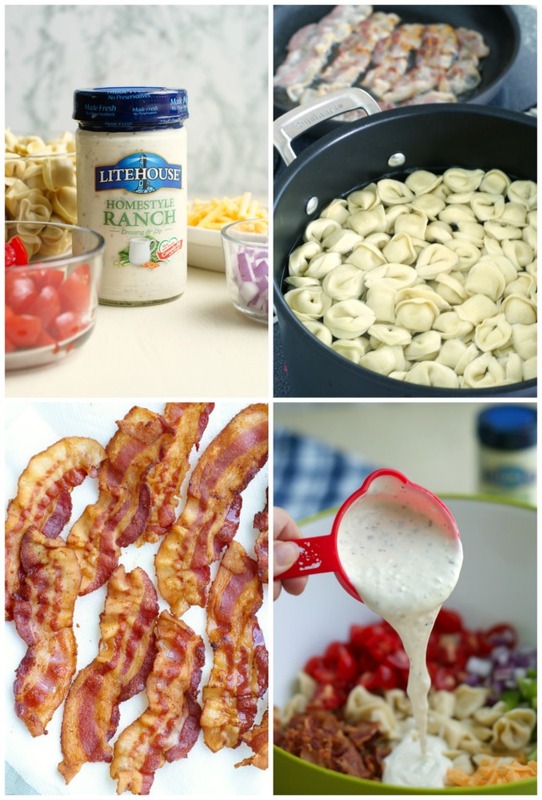 I mean, what goes better with veggies and bacon than fresh-tasting, cool, creamy, ranch?! I've had a lot of ranch dressing in my days, and I have to say, I kind of love that Litehouse dressing is bought cold. Yup, that's right, it's found in the refrigerated produce section of your grocery store right next to the fresh veggies it pairs so perfectly with! Makes complete sense if you ask me. Cold is where it's sold! I like to shop the outer edges of the grocery store for the freshest finds and that just so happens to be where you find the Litehouse dressing. Love it. Real food deserves real dressing! I can't wait for you to try this delish salad. 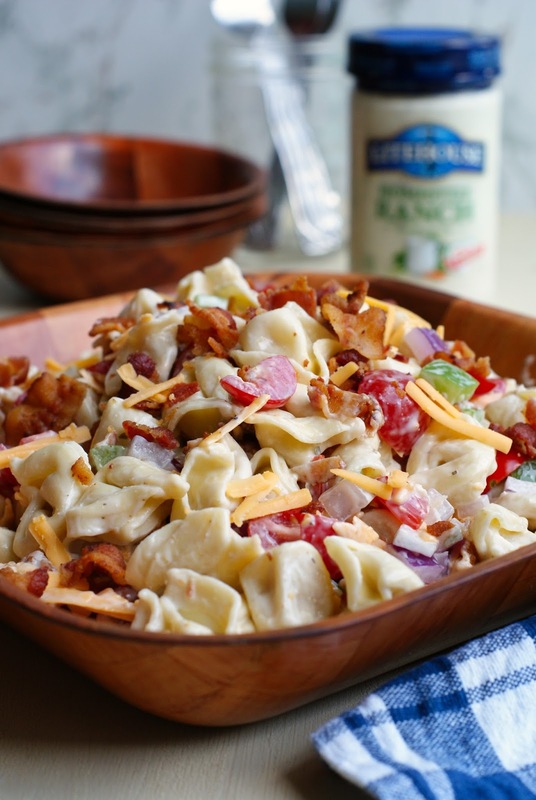 Here's to filling up the bellies of your loved ones this summer with yummy, fresh, made with love dishes just like this Bacon Ranch Tortellini Salad made with Litehouse dressing! Enjoy! Cook the tortellini according to the package directions. Drain and cool in an ice bath. Drain again and refrigerate while preparing the bacon and vegetables. Heat a large skillet over medium-high heat. Cook the bacon until crisp, drain grease, then roughly chop. Set aside 1/4 cup of bacon to use as a garnish. 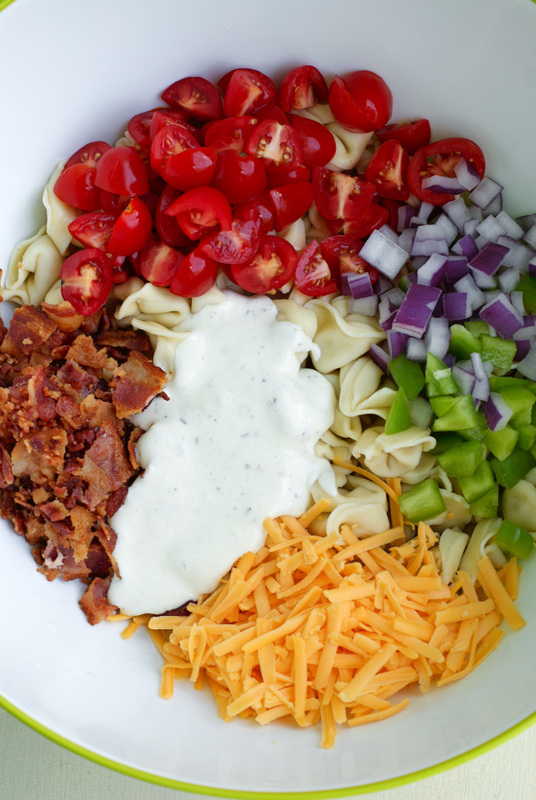 In a large bowl, toss the cooled tortellini, crumbled bacon, tomatoes, cheddar cheese, red onion, and green pepper with the Litehouse Homestyle Ranch Dressing. Garnish with the reserved crumbled bacon and serve immediately. You can add more dressing to the salad is you prefer a more creamy texture. Make this a main dish salad by adding cooked diced chicken. Yum! Use hashtag #SeetheLite to join the conversation on social media! Now this is a hearty meal and if don't make my own ranch, I always buy Litehouse. It is the best. Will all the ingredients hold up alright if it's made ahead of time and refrigerated overnight? It holds up okay, but absorbs a bit of the dressing. If anything, I would keep the bacon separate until serving and I might add a bit more dressing right before serving.